Last week we were among the lucky paddlers to demo the new P&H Hammer. The prototype was at the Golden Gate Sea Kayak Symposium and then journeyed to the Mendocino Coast with us for some post-symposium rock garden play. Check out Bryant Burkhardt's Paddle California Blog with photos and videos of the fun. Now that the Hammer and our friends have left, it is time for us to get busy on the nuts and bolts of the business of running Liquid Fusion Kayaking. If only the kayak business was as fun and simple as kayaking, kayaking, and kayaking. Website updates and reviewing/revising the business plan are what's happening at LFK Headquarters. These are exciting times for us. 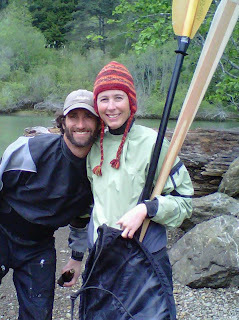 We can hardly believe that next month - Liquid Fusion Kayaking will be celebrating the conclusion of 5 years on the Mendocino Coast. Jeff had been guiding on the Mendocino Coast for many years; however, March 2008 was when we decided to base the business here and I decided to leave my job with Fort Bragg Unified School District to partner with him in Liquid Fusion Kayaking. We are looking forward to reviewing the trials and triumphs of the last 5 years and planning for the future of Liquid Fusion Kayaking. Thanks for sharing the journey with us!!! Hi, I see you post once in a while on Mendobirds. I'm in Anchor Bay. My blog is mendonomasightings.blogspot.com Would you consider doing a guest blog on my blog, telling my readers what it's like to kayak there? I'd also be happy to put a link to your blog. My email is jackson2@mcn.org.